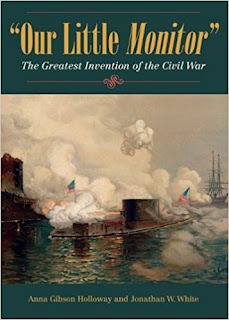 Review of Holloway & White - "'OUR LITTLE MONITOR': The Greatest Invention of the Civil War"
On March 8, 1862 the Confederate ironclad ram Virginia steamed into Hampton Roads and proceeded to smash up the Union Navy's powerful oceangoing blockading ships stationed there. In its first battle, the fearsome vessel made short work of both the USS Congress and Cumberland, and only awaited the following dawn to finish off the grounded Minnesota. Instead of that expected scenario occurring, the USS Monitor arrived on the scene in improbable Hollywood hero fashion to save the day, fighting the Virginia to a famous draw on March 9 and inaugurating a new age of naval warfare. 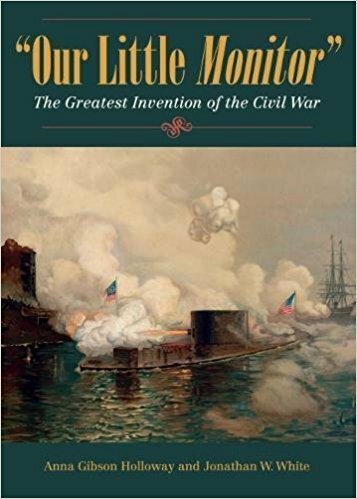 The birth, celebrated life, death, and afterlife of this technical marvel are recounted in Anna Gibson Holloway (former curator of the USS Monitor Center) and Jonathan W. White's "Our Little Monitor": The Greatest Invention of the Civil War. 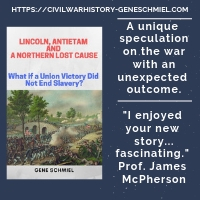 Given the extensive nature of the existing literature regarding the construction and operational histories of the USS Monitor and CSS Virginia, some of the ground covered in the book will feel quite familiar to many readers. The sections discussing well-known topics such as the Confederate conversion of the USS Merrimack to CSS Virginia, the troubled relationship between the US Navy and Monitor designer John Ericsson, the whirlwind construction of the Monitor, the Battle of Hampton Roads, the Monitor's sinking off the North Carolina coast, and the ironclad's modern day rediscovery and recovery are relatively brief and not really intended to supersede the finest existing narrative accounts. Even so, sprinkled within those very engagingly written syntheses are bits of fresh information based on some previously neglected sources and the latest archaeological discoveries. 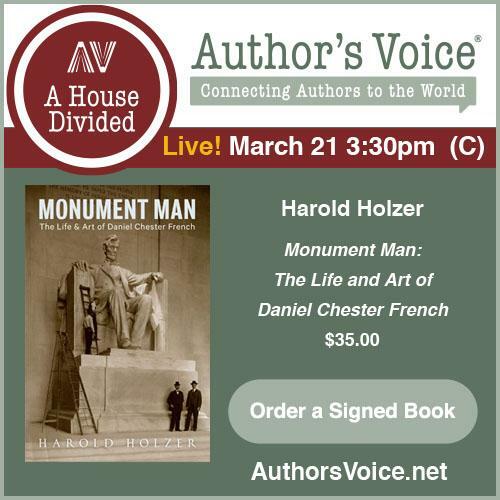 Where the book really stands out from the rest is in its rich illustrations, its discussion of the Monitor as pop culture icon, and its historical document collection. "Our Little Monitor" is truly a feast for the eyes. Beyond the initial sensation of great heft (the volume's solid binding and construction combined with its thick, glossy pages give it an unexpected weight), the reader is most immediately struck by the beauty and variety of illustrations, many (and perhaps most) of which are presented in vivid color. To go along with modern images of preserved artifacts and recovery operations, all known period photographs of the ironclad are reproduced in the book, as are a great number of individual officer and crew pictures. Given the relative brevity of its time in service, the vast assemblage of artwork celebrating the Monitor and its great battle with the Virginia attests to the wider cultural impact of the ship, as do the many Monitor-related broadsheets, advertisements, and magazine covers. On the more technical front, engineering design drawings and multi-purpose sketches also abound in the pages of the volume. The book's vast collection of photographs and illustrations of all kinds really does comprise an exceptional visual record. My only "complaint" is wishing that some of the more stunning chromolithographs could have been rendered full-page in size. The northern public really took to the Monitor, and the authors present a very thoughtful discussion of the vessel as cultural phenomenon. Even though it belied the North's status as the absolute colossus of the two warring sections, the home front citizenry seemed to revel in the more diminutive Monitor's underdog status in its fight with the dreaded enemy goliath, and the whole nation seemed to take ownership. In recounting the massive crowds that demanded tours of the ship when it was undergoing repair and refit at Washington Navy Yard, the book offers further evidence of this collective appreciation for "Our Little Monitor" and what it meant to the nation. Even with the considerable security concerns and desire to get the vessel back in the war as quickly as possible, the popular crush forced the navy to admit the public on board, where they promptly made off with everything not nailed down. Indeed, what some citizens viewed as a cold, mechanical killing machine that rendered the fighting men within less heroic than in the days of 'wooden ships and iron men,' became a true object of affection for many more. Like perhaps no other Civil War weapon, the Monitor was commonly anthropomorphized by the public, who celebrated it in prose, songs, and poetry. In true American fashion, the ship was also shamelessly exploited for product promotion. It's influence was deeply felt in other ways, too. Monitor models graced many a northern parade, and the vessel's image proved to be a very effective fundraising tool. 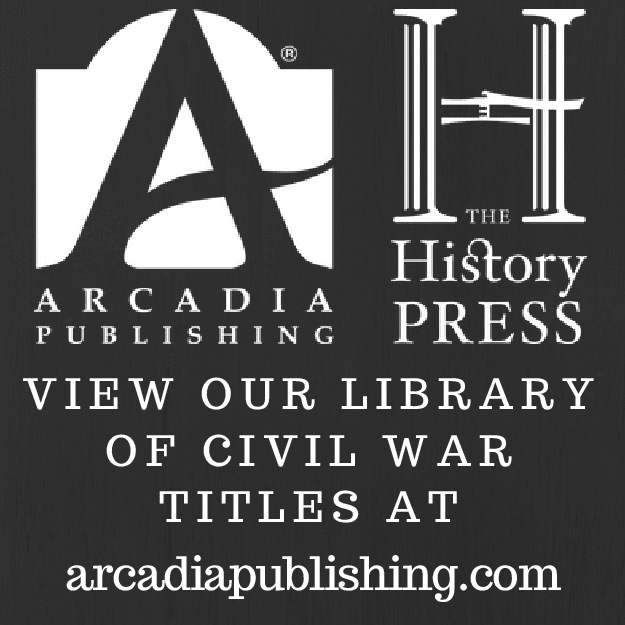 Contained in Part 2, the volume's document collection includes several previously unused firsthand sources, in particular those written by witnesses to the Hampton Roads battle and the sinking of the Monitor off Cape Hatteras. The book's assemblage of unsolicited citizen letters (with accompanying drawings) to Lincoln outlining various schemes for defeating the Virginia will also interest many readers. Though often amusing and more than a bit perplexing in their impracticality, the thought and effort that went into the proposals demonstrates how engaged the public was in the debates and discussions over how to deal with the enemy's ironclad menace. Another section tracks contemporary newspaper articles that followed the progress of the dockyard repairs to the Monitor. Whether it was the greatest invention of the Civil War or not, no one can doubt the profound impact the USS Monitor and its many direct descendants had on the firm establishment of Union naval supremacy and, by extension, ultimate victory in the conflict. "Our Little Monitor" possesses original features of considerable value and is a remarkably comprehensive visual and narrative record of the service history and enduring legacy of the vessel and its crew. It deserves a spot on the bookshelf of every Civil War naval library. Book News: "An Arch Rebel Like Myself"